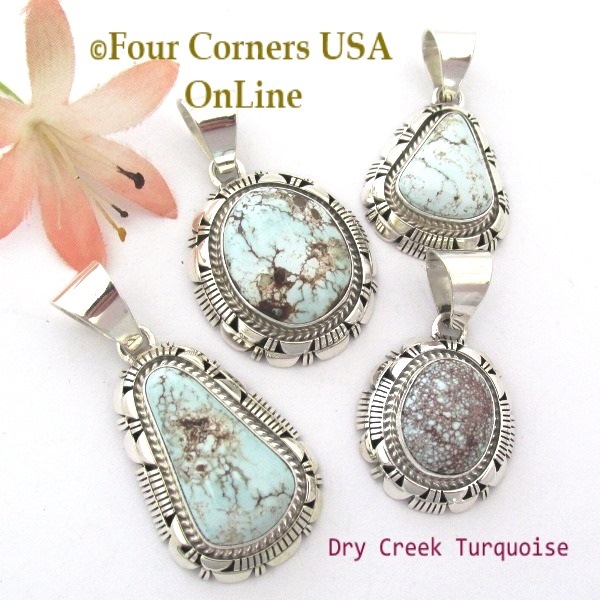 Choose from a extensive and varied selection of Authentic Native American Indian made Dry Creek Turquoise Sterling Silver Pendants, Necklaces and Sliders. 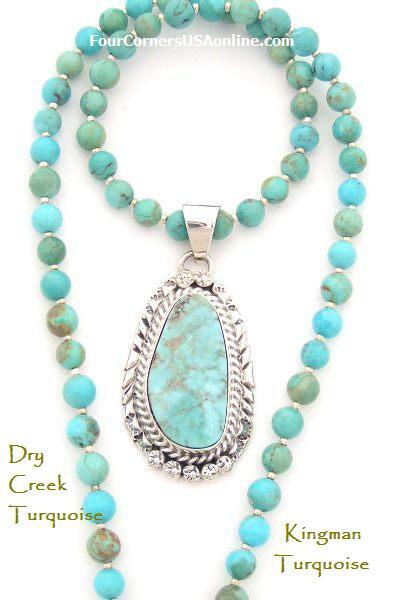 We offer a selection of our Dry Creek Turquoise Pendants complete with chains and some without. Many of our Navajo Sterling Silver Dry Creek Turquoise Pendants are custom designed with Gemstone, Freshwater Pearls, Navajo Silver Beads and American Turquoise Bead Necklaces to further enhance your one of a kind jewelry treasure. With the advantage of having a large selection of Turquoise Bead Strands on hand, periodically colors just pop and blend even when they are from various Turquoise Mines and the results can sometimes just amaze. Newest arrivals to our Dry Creek Turquoise Earrings Collection by some of our favorite Navajo Silversmiths plus a few new surprises by up and coming jewelry Artisans offering classic elegant styling! Quantity versus Quality is the age old question and our newest selections of Dry Creek Turquoise Jewelry are sporting some of the best quality stones we have seen in a while. We list each piece separately with several images for each taken at different angles for your examination. Since some Pendants have subtle differences, we invite you to use our 'Comparison' Tool to view up to 4 selections side by side. It is a fantastic opportunity to view the color shading differences, size and simply to see them side by side! 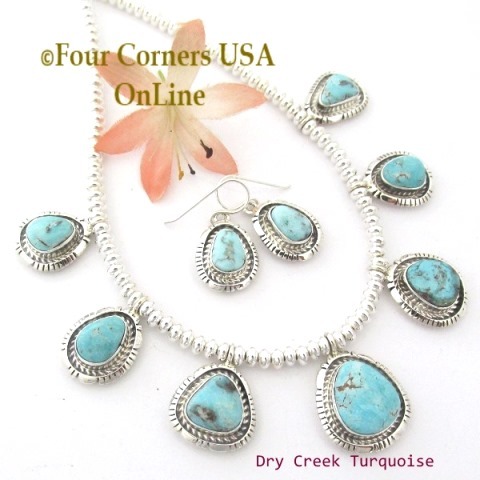 We hope you enjoy our Collection of Nevada Dry Creek Turquoise Silver Jewelry. Always Native American handcrafted.